The exiting creative challenge for us was to develop and design an intriguing C-Place concept based on the Boskalis need: “a global deployable flexible exhibition concept for multiple years” Our thinking was fuelled by the following dynamic specific ingredients: the creation, visualisation and introduction of a new distinctive Boskalis brand identity attractive and impressive as well as recognizable and appealing to all Boskalis employees, relevant stakeholders as well as all existing and future business relations in the international Offshore-, Oil & Gas- and Heavy Marine Transport Market the presentation of all Boskalis services. 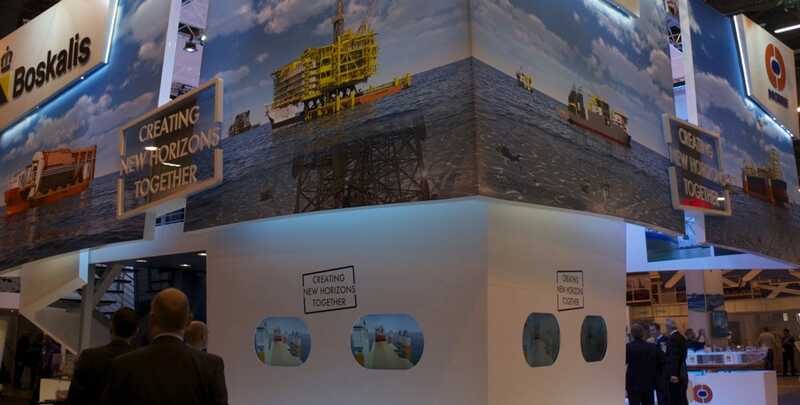 The outside of the C-Place design should attract the audience with catching imagery without compromising the impact of the brand name Boskalis and its subsidiary Dockwise. The inside should allow ample space for the Boskalis immense product and service portfolio. Combined with the specific Boskalis demands to be easy accessible, welcoming and able to facilitate enough hospitality and meeting space, the available stand space had to be used to the absolute maximum. Wether it is a 150m2 stand space at the OTC in Houston or a 36m2 space at the ONS in Stavanger. By fully using the outer boundaries of the allocated booth space, we were able to create a very powerful and purposeful high impact outer facade, visible from greater distances. This facade enabled us to design an eye-catching, panorama-like interior. We are able to communicate all Boskalis services supported by high impact photography. Because the stand is completely open on eye level, visitors are able to walk on to the stand from all sides. The stand interior is highly communicative, capturing the full attention of the visitors, welcoming the visitors into the world of Boskalis.